In their last three games, the UCLA Bruins, owner’s of the nation’s sexiest offense, have posted efficiencies of 109, 102, and 99 points per 100 possessions. That accounts for three of the Bruins’ six worst 2016-17 performances. Trend or slump? I believe it’s the latter as the Bruins were a little banged up and had perhaps lost the element of surprise. Consider, UCLA’s lackluster performance in the Pac-12 tournament came against two teams it was playing for the third time each. Disinterest? An excuse Steve Alford in fact danced with. Nevertheless, Bryce Alford is 5 for his last 25 from distance (during the aforementioned three games) while Aaron Holiday was 5-19 in Vegas. And here’s a little food for thought. In ignoring the adjusted metrics (the default KenPom numbers I generally cite and that you’re most used to), I wanted to see just how “bad” UCLA’s defense has performed. By even the adjusted numbers, their defense has most certainly improved, it’s currently sitting at 99.8 points per 100 ranking 78th nationally. The last team to make a Final Four outside the top-60 in adjusted defensive efficiency was VCU (fun fact #23). But I needed some additional perspective. So looking at the raw data, the Bruins indeed rate worse, 101.3 points per 100 (113th nationally), but what of their peers in that 100 PPP range? Kansas, Duke, and Creighton all rank greater than 80th nationally with raw defensive efficiencies of 100 or higher. This is a distinction that, of course, is directly addressed by the the adjusted metrics (most notably impacted by opponent and location). But in trying to contextualize some parts of the UCLA dilemma, I thought this might be helpful. To some extent, it suggests that the Pac-12 was so abysmal it cost what many of us saw as a poor UCLA defense an adjustment into mediocrity (Kansas 28th, Duke 39th, Creighton 40th). Thus, as you sort your brackets, remember all those shots UCLA made and perhaps ignore some punditry. At what point is the 15-17 record exhausted? What about the letter? You’re unfamiliar? Perfect. Let’s be besties. The Bruins concluded 2016 with their 4th losing season since 1948. That’s a minute. And because it was the fault of the defense (199th nationally, 9th in the Pac-12), Steve Alford returned his contract extension bonus ($5.2M) and apologized to fans. We’ll get further into things below. But UCLA basketball hasn’t felt like UCLA basketball for awhile. What’s going to change this year? Is it a top-5 recruiting class? Seen it. Is it a new attitude? Heard about it. What? Will? Change? UCLA’s offense is fine. Mostly at least. Perhaps that’s an odd lead following their first loss to the enemies of Troy since 2013. But in last night’s game the Bruins still managed a 75 spot, an efficient-ish 1.03 points per possession. Speaking of possessions, Andy Enfield earns his first win against UCLA in the Enfield-Alford rivalry’s second fastest game. Basketball is moving away from the mid-range shot. It’s calculated in many ways, the emergence of Synergy Sports (sponsor me??) certainly giving different context to the shot, but it’s indubitably the highest-risk, lowest reward attempt in the sport (aside from hiring a retread). It’s the Allegiant Air of jumpers, the fire-Mark-Richt of shots, the-sleeping-with-a-Kardashian of attemtps. “FEED ME!!! !” screamed the emaciated college basketball news cycle. The monster, who hadn’t eaten a satisfactory meal since Andre McGee was paying hookers and Rick Pitino didn’t go to ACC media day was starving. The tip-off marathon wasn’t going to cut it. His belly growled as he had nothing for bleary-eyed college basketball nerds watching 24-hours of their favorite sport. I think their quality of play and who they are today would be much different than, for example, who they would have been in December, November. Unfortunately, a lot of the judgment comes in November and December. So this happened and no one really foresaw it. 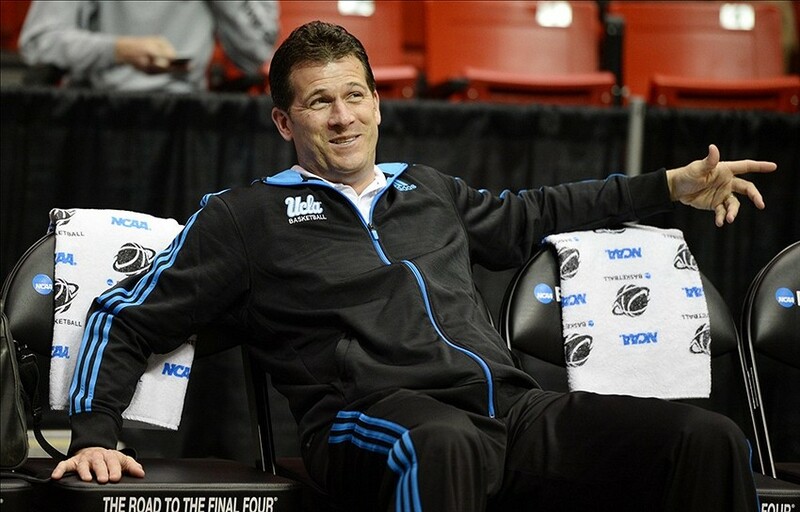 Quickly after losing to Arizona Steve Alford got to campaigning and evidently it worked. An eleven seed suggests they were pretty squarely in the dance according to the committee who said the Bruins passed the “eye test.” I get it. I also get that they’ve played absolutely no one over their final five games suggesting that the committee believes their losing effort to Arizona was eye pleasing enough. This selection has no one happy but you know what? #BackThePac. Because, quite frankly, the Bruins have talented enough players to be tournament disruptive. They are Pac-12 basketball. It’s basically the Conference of Champions because of UCLA. For an entire season they alchemized the “C” on all jerseys to commemorate 100 national titles (Internet Fun: find the best line in this confirming article). UCLA – with Arizona on its heels – is the torchbearer of Pac-12 basketball. But UCLA’s not there right now. And although they’ve fallen on tougher times we won’t let that diminish this rivalry. GameDay recognizes, why shouldn’t we? UCLA may have dropped what appeared to be a quintessential trap game (ASU is actually pretty good even if their student paper concedes on court success for off court fun), but the Bruins are also 4-1 against Arizona in the last five meetings. In December, we looked into how Jordan Adams had changed his game. A mid-range threat as a freshman, Adams had improved his offensive efficiency by getting to the rim. He had changed his game. And now he’s changed his mind. News dropped over the weekend that the efficient shooter would be foregoing his remaining two years in Westwood to head to the NBA. This differs from his initial April 17 declaration to stay in school. He gone. This flip flop is a major blow to the Bruins. Their starting lineup will be 80% brand new and Bryce Alford will almost certainly be starting. Stay tuned for rants of Daddy Ball wielded by the Hoosier Loser (fear not, you’ll never read that here). You don’t need me to spell out the significance of Adams’ departure. He was arguably the best returning player in the conference and was easily the best player on UCLA’s roster. With the Family Wear and Kyle Anderson already gone, Adams was going to be the centerpiece, likely expanding on what was already the conference’s 8th highest usage percentage. This is kind of a big deal. And with regards to the Pac-12 landscape, I had hinged the Pac-12 off-season on the professional decisions of Adams and Spencer Dinwiddie. Both star guards were faced with tough choices. Furthermore, both seemingly held the fate of their teams’ 2014-15 success in their hands. Both have now chosen pro pastures and leave Alford and Boyle with some significant coaching opportunities. Good luck, gentlemen. Of course it should be noted that both teams project to be in the upper half of the conference. UCLA has pieced together a nice class and Isaac Hamilton has had a year on the pine (after transferring from UTEP) to learn the Alford way. Colorado has a talented group that will now have the added benefit of knowing exactly what they’re working with and can lose their “deer in headlights” look they wore following Dinwiddie’s injury. It’s an uphill battle for both but a challenge both rosters are prepared to handle. All of which begs the question: Is it November yet?